Hitting a deer is no joke. An average adult deer can weigh at least couple hundred pounds. Hitting a deer while traveling at over 100 mph... well, physics dictates the results to be grisly and dreadful. Like something out of a slasher film. A deputy in Isanti County, MN, was responding to a report about a man with a gun at a restaurant in the early hours of last Saturday morning, reports local outlet Isanti County News. 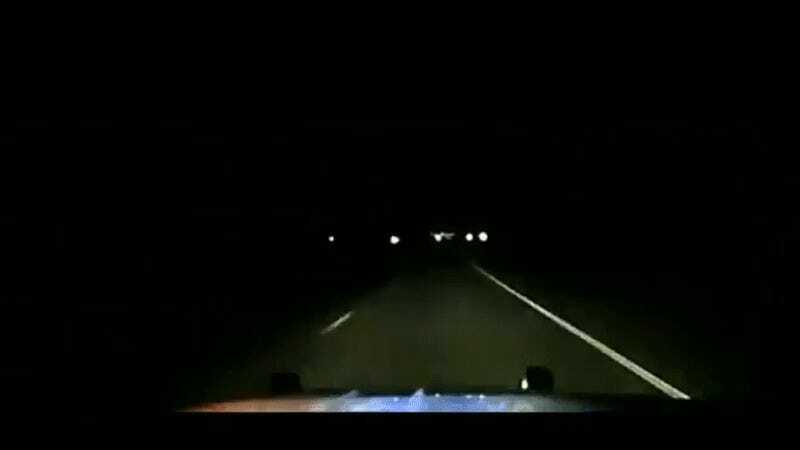 He was traveling down a dark road in the squad car with the lights and sirens on at 114 mph when, suddenly, a deer leapt out from the side of the road. There was no time to stop. Miraculously, the deputy was able to walk away from the incident uninjured, despite both front airbags deploying and the hood going into the windshield. He was also able to keep the car in its lane during the crash. Below, you can see the deputy’s dashcam footage, as well as some photos of the aftermath. Warning! The following video and images are graphic.